Living… locked away in a mental institution for the past 17 years. Walter was accused of experimenting on humans after one of his assistants died in 1991. He was charged with manslaughter and instituted at St. Claire’s Psychiatric Institution – with only immediate family members permitted to visit him. But after a flesh-degenerating toxin infected an FBI agent, agent Olivia Dunham sought Walter’s expertise in hopes of saving his life. Olivia blackmails Peter Bishop, his unwilling son, into releasing Walter and the three of them begin to investigate bizarre cases. Profession… unlocking the mysteries of pseudoscience. 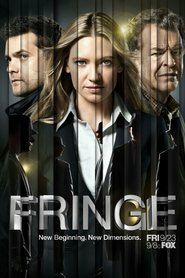 Walter, Olivia, and Peter have been recruited by the FBI’s Fringe Division to investigate “The Pattern” – unexplained scientific phenomena occurring around the world. Security Senior Agent Phillip Broyles (Olivia’s boss) described The Pattern, “As if someone out there is experimenting, only the whole world is a lab.” Walter takes over his old lab, in the basement of Harvard’s School of Public Health, to investigate these incidents. Relationship Status… widow who longs to establish a relationship with his son. Peter does not remember much of his childhood, but firmly believes that his father was a constant source of chaos and heartache. Peter was relieved when his father left, and only talked with him once in the subsequent 17 years. Walter hopes to finally get closer to his son now that the two of them are working together. Challenge…regaining his sanity and saving the world. Walter’s mind was seriously handicapped by the years he spent at St. Claire. With the team constantly facing high stakes, Walter struggles daily to stay in touch with reality and keep those around him safe. Personality…brilliant, loyal, damaged. Before being institutionalized, Walter was a brilliant mastermind who (at times) lacked a moral compass. Peter eloquently described him as “the most self-absorbed, twisted, abusive, brilliant, myopic son of a b***h on the planet.” Walter’s stint at St. Claire’s left him a shell of the man he was. Walter Bishop's popularity ranking on CharacTour is #1528 out of 5,000+ characters. See our top-ranked characters and read their profiles.